Quarterly - INTERNATIONAL COCKSHUTT CLUB INC. If you have paid your membership dues and are not receiving your Quarterly, please let Kim Waggoner (U.S. Membership Secretary) or Valerie Weber (Canadian Membership Secretary know. Valerie can be reached by e-mail at veweber@sympatico.ca or phone at 519-367-2050 . 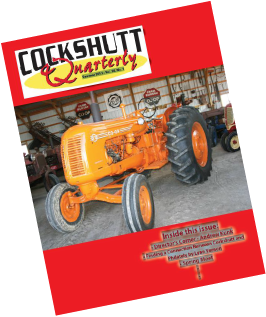 If you have an interesting story to submit for the Quarterly, please send it to Deb Bradley by e-mail at ddmbradley@msn.com or phone at 612-729-3795.